The circus has come to town: a sure sign that autumn has arrived. In the square behind our home a riotous collection of goats, lama, camels, long-horn cattle, geese and other creatures are incongruously dotted around the lawns of the Place de Foire, calmly awaiting the first show tonight, like the professionals there are. We can hear the music and the announcements of the promotional vans. After a short, hot summer, autumn has been variously warm and wet or cool and wet, conditions which are driving vineyard owners to the point of despair. The grape harvest started in mid-October and depending on the variety, will continue in the rain for the next few weeks. This is going to be a challenging year to produce fine wine in the Loire Valley and I feel for the growers. I have three weeks’ worth of residential garden design and CAD courses starting on Saturday and am desperate to get out and tidy up the garden before students start to drift in from around the globe. Our first Israeli garden designer arrives for a week of CAD training on Saturday, while a parks manager from the Sultanate of Oman will be with us at the end of the month for two weeks of study. We work a lot with garden professionals from Oman and I find their horticultural skills to be of a very high standard: I must get the weeding done! Despite, and in some cases because of the rain, there is still plenty going on in the garden. Yellow flowered Buddleja x weyeriana has been in bloom for months and shows no sign of wanting to stop. 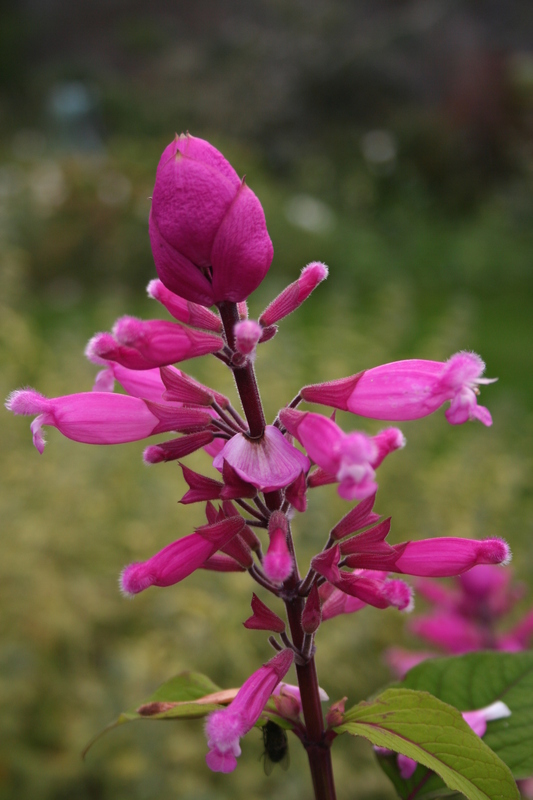 Salvia species like S. coccinea, S. patens, S. leucantha, S. elegans, S. microphylla, S. uliginosa and S. involucrata are all looking superb and I am taking cuttings of many of them at the moment for insurance purposes – some may be killed by a cold winter. 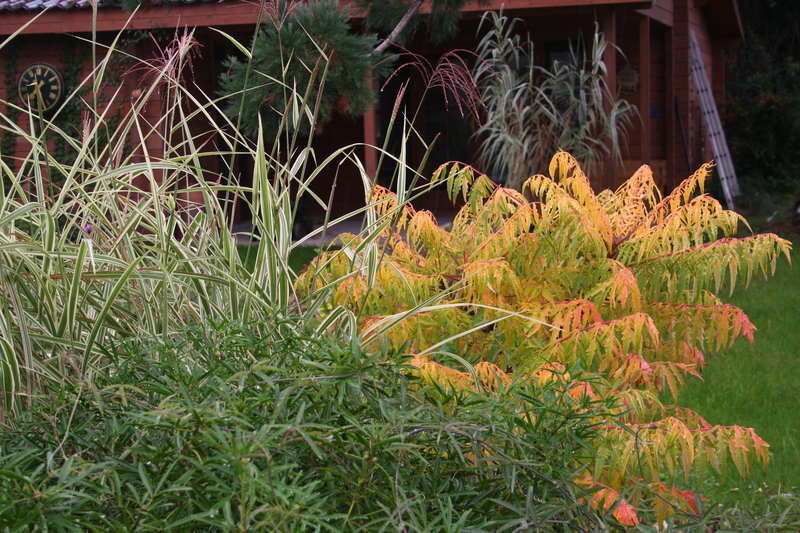 Grasses are also looking good; we have several Miscanthus sinensis varieties, the majority in flower at the moment, while there are signs of autumn leaf colour on shrubs such as Rhus and Hamamelis. Anemones are showing well, especially Honorine Jobert in the white border and in the oriental garden the Colchicum Waterlily are in full flower. I know, Colchicum autumnale is a European native – I do things like this to see if you are concentrating. 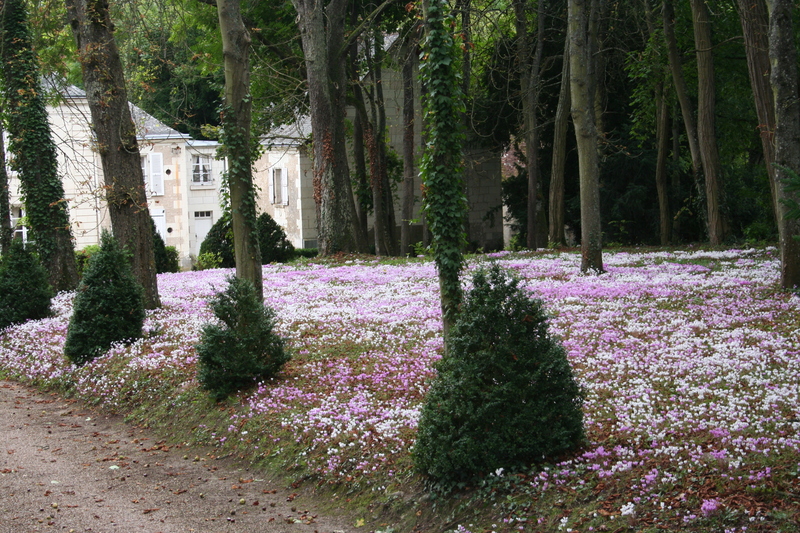 Under the trees in the parks of the chateaux of the Loire Valley, both great and small, blankets of pink and white Cyclamen are in bloom but in the borders the gardeners are removing summer bedding ready to replace them with winter / spring flowering varieties. A great garden like Chenonceau must always look good, so the change-over brings out dozens of gardeners to get the work done in the shortest possible time. Sunday will be the last opportunity to see the gardens of the International Garden Festival at Chaumont sur Loire; it closes its doors to the public on 20th October and reopens with two dozen new gardens in the spring. I shall be going with a group of garden designers to see how it has progressed since my last visit earlier in the summer. In the mean time we look forward to the 2014 edition, which will try to conjure up both the faults and the excesses of our time and the free, spiritual universe of eternal gardens, with the show theme: “Garden of the Deadly Sins”; expect to be challenged! Sadly, because I am teaching, I will not be attending the plant fair at Courson, south of Paris this autumn, saving a great deal of money by missing a favourite plant-buying expedition. There will be other opportunities I have no doubt. In my last article for the monthly magazine Hertfordshire Countryside, I allowed a smug comment about our mild weather to creep into the text and was rewarded, a few days later, by six inches of powder snow and temperatures down to minus 12 degrees C. The distances I travel to visit clients have increased enormously since the days when I was based at a Hertfordshire garden centre, so observations of that sort will be kept to a minimum from now on, in the interests of road safety. These visits see me gardening in an ever increasing variety of climatic conditions: a trip to Cornwall in January was swiftly followed by a garden in the Sologne region of forests and lakes of central France; in a few days time I will be in the Dordogne to help turn a muddy field into a glorious garden for an English ex-pat family. While growing conditions are different at each of these properties, my teaching involves me in the gardens of students from around the world. We have one who lives at 6,000 feet in Colorado Springs, where there are frosts for 200 days of the year. Other challenges include low humidity, fluctuating temperatures, bright sunlight, heavy calcareous soils and drying winds, which often restrict plant growth more than low temperatures. Another student studying garden design with us is currently living in semi-tropical Australia. I am learning as much as I am teaching these days. Our own garden is still nowhere near completed so perhaps I can be forgiven for dreaming about how it could be. No longer do we have teams of landscapers at our disposal, keen to help out the boss when work is slack. Now, if I need a patio or a new lawn, I have to either lay it myself or pay a landscaper to do it for me, just like any other homeowner. Unlike our clients, I will not be witnessing the creation of an instant garden and this time it is likely to take us several years to sort out. Perhaps that’s how it should be. Many times on the pages I have suggested that if there is not much in the way of flower or interest in your garden at a particular time of the year you should take a look around a garden centre or nursery to see what plants will fill the gap. In our last garden I used to make a point of counting the flowering plants over the Christmas / New Year holiday and could normally find a dozen or two species. This year we had just two plants flowering outside – Jasminium nudiflorum and variegated Skimmia Magic Marlot – and a couple of Camellias in the unheated, north-facing conservatory. There were a few berries too, from Pyracantha and a Holly planted in the shade of our ancient Sequoia, but this lack of colour and interest must be addressed with some urgency. One plant I miss from our English garden is Sarcococca. I planted one close to patio doors where its sweet scent could be enjoyed for many months over the winter. We had it hidden behind a black stemmed bamboo so that visitors could smell it but not see it without a bit of effort. Sarcococca or Sweet Box is amazingly easy to grow and thrives even in shade. A suckering evergreen shrub, it comes in a number of varieties from Sarcococca confusa, the largest at up to 6ft tall, to diminutive Sarcococca humilis. Our plant was S. hookeriana var. 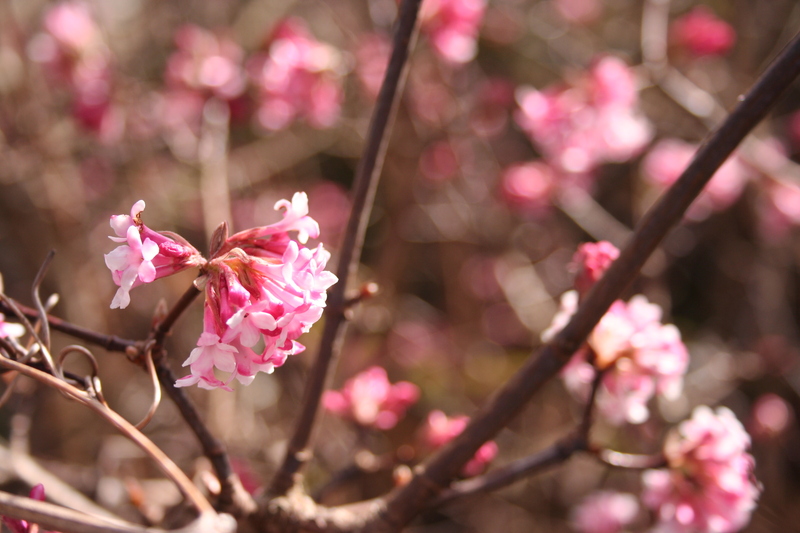 Digyna, tidier and with pinkish flowers on an elegant little bush. As a Chinese native I have mentally reserved a place for one in our Oriental Garden. Fragrance is one of the benefits of many winter flowering plants; our potted Camellias sasanqua and grijsii are both delightfully scented and give pleasure to anyone coming to the front door. 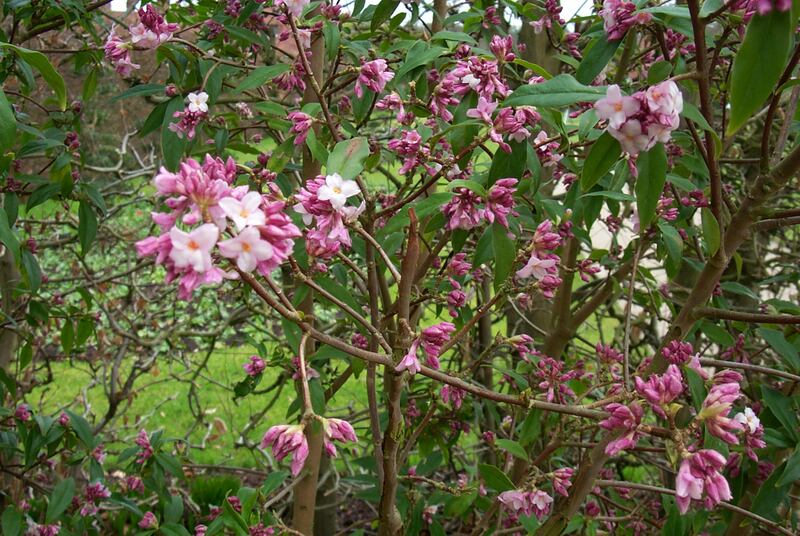 A favourite scented plant I have yet to own is Daphne bholua ‘Jacqueline Postill’, ‘Peter Smithers’ or the similar ‘Penwood’. While my heart says to go for the first, the other two are more reliably evergreen and equally perfumed. Any of these will satisfy me however and I trust one will be planted here before too long. I have a Daphne mezereum in the garden but, as so often happens, the plant has been grow in a nursery field and potted before sale, resulting in damage to the root system that prevents it thriving. The scented purple-pink flowers of this European shrub are a joy at this time of the year but I have been singularly unsuccessful in growing it so far. 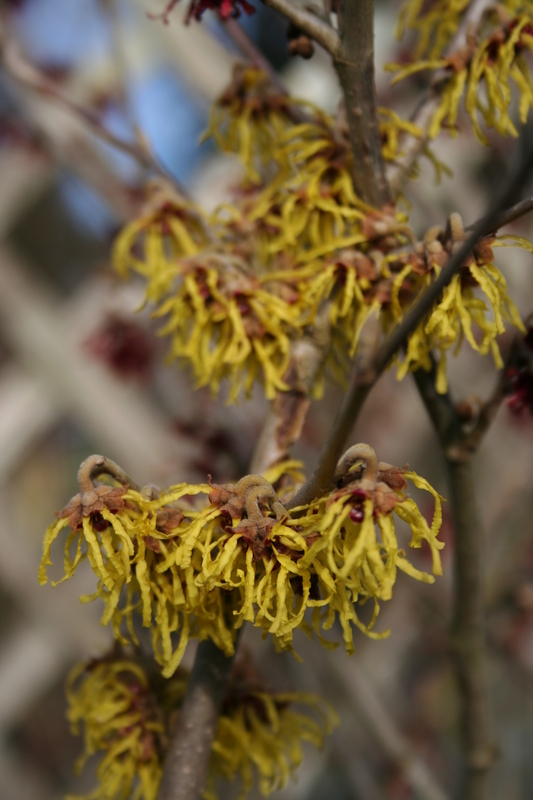 We already have a fine Witch Hazel, Hamamelis x. intermedia Arnold Promise which, while not flowering for Christmas did not keep us waiting long. H. x. intermedia is a cross between species from China and Japan and this variety was bred in America by the Arnold Arboretum in 1928. The incredibly fragrant, bright yellow flowers appear just a few weeks before Forsythia and so can be thought of as providing a kick-start to spring. It would be nice to also grow one of the red flowering cultivars and of these Diane perhaps the best. We have planted a selection of bulbs and both Snowdrops and Winter Aconites are ideal for early flower. 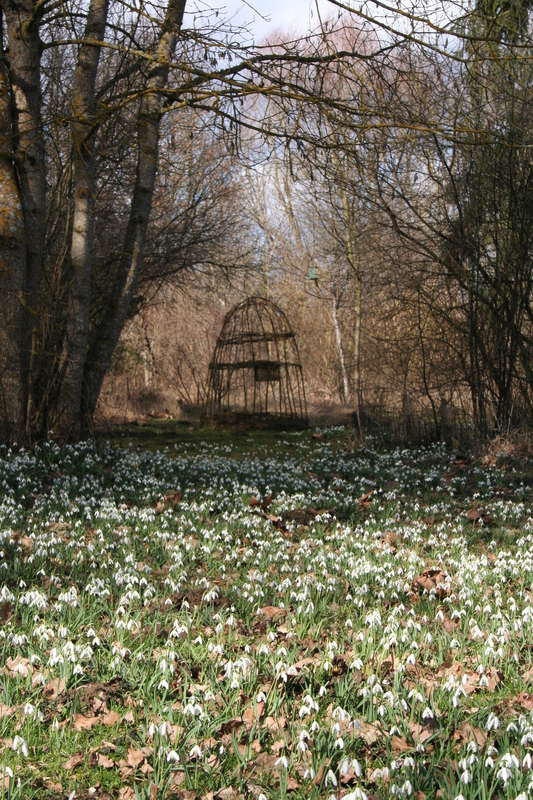 Snowdrops spread rapidly and the gardens around the old mill at Chabris have thousands growing in the lawns. 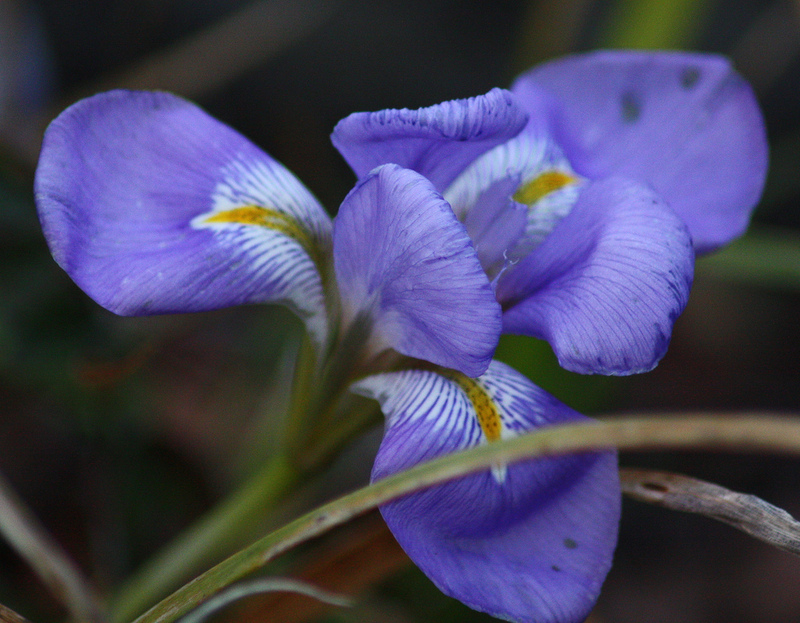 Iris reticulate and unguicularis can be relied upon for winter flower while some of our Daffodils also begin to flower in February. The list of “missing” plants I dream about includes some common plants like Mahonia media, a plant I rarely fail to specify for the gardens of my clients. Again scented, again yellow, I like the story about the naming of the three Mahonia varieties Faith, Hope and Charity, bred at the Royal Gardens, Windsor were I worked under Hope Findlay. Chaenomeles, the flowering Quince, is commonly grown here but has yet to make an appearance in our garden. With more than 70 varieties to choose from I shall be looking for something out of the ordinary, perhaps Cameo or Geisha Girl in peachy-pink, Lemon and Lime with pale green flowers or C. ‘Toyo-nishiki’ which displays flowers in red, white and pink variations and has large fruit ideal for jam making. I find it hard to accept that we grow no Hellebores and jealously eye flowering plants in neighbours’ gardens. 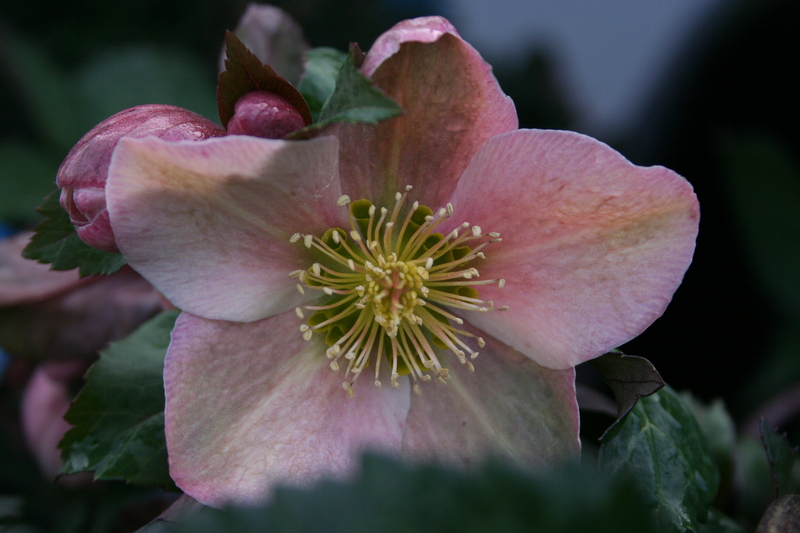 We have always had Hellebores in our gardens, either H. orientalis, the Lenten Rose, or H. niger, the Christmas Rose and used to carefully select seedlings to maintain interesting colours. 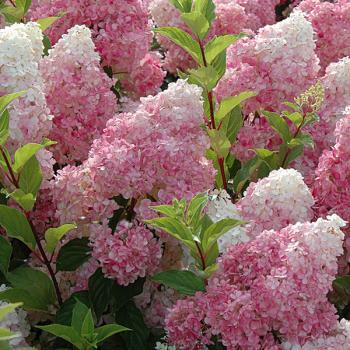 Now hybrids exist between many species and the range of colours, leaf forms and flowering times has expanded along with their popularity. With plants selling for up to £25 over here I shall be hoping to buy one during a UK trip or beg for seed from a local gardener. So many people tell me that they rarely venture into their gardens during the winter and this seems such a shame. 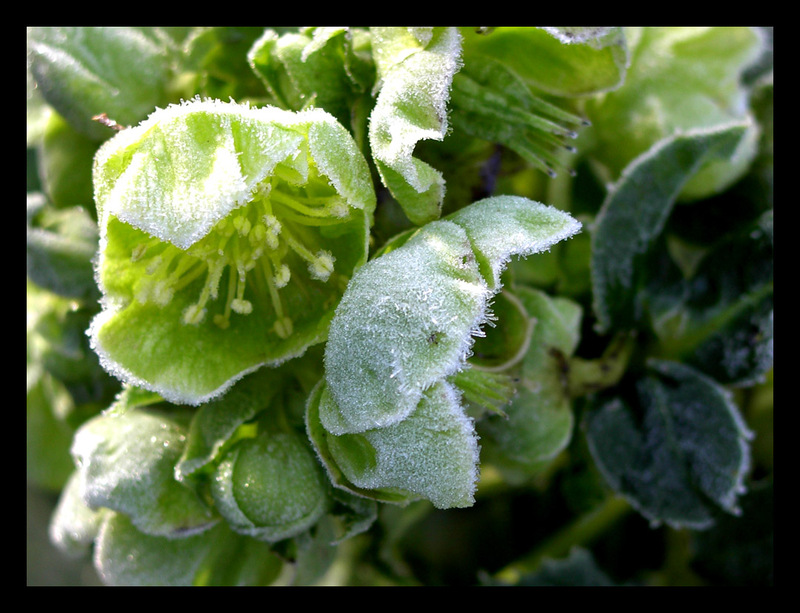 Those who brave the cold weather should be given some encouragement and reward for doing so in the form of beautiful garden plants. I hope this review may inspire you to add extra colour and scent to your own garden.